A recent Somerville trucking accident on Interstate 93 near Exit 29 took the life of a 27-year-old man from Lynn. According to state police, the accident happened as a flatbed truck was traveling southbound when one of the heavy-duty tires snapped the lone strap that was holding it to the bed of the truck. Once the tire was launched into the highway, it bounced across the median into northbound traffic and smashed into the vehicle driven by the 27-year-old man, according to The Boston Globe. The incident caused the man’s car to roll on its side. The driver was transported to Massachusetts General Hospital where he was later pronounced dead from injuries sustained during impact. Our Massachusetts injury attorneys understand that truck cargo can kill when improperly secured. The tires that were being transported on the flatbed weighed approximately 400 pounds each. This is yet another example of the importance of ensuring a truck’s load is secured properly. Highway officials shut down the interstate for about an hour and a half to conduct an investigation. Criminal charges are pending. Unstable loads can happen to you, too. Inexperienced individuals can often over-pack and neglect to secure cargo when moving furniture, appliances and other household items. But most often, you’ll witness an unstable load on the bed of a commercial truck. These conditions can produce serious, costly and potentially fatal results. 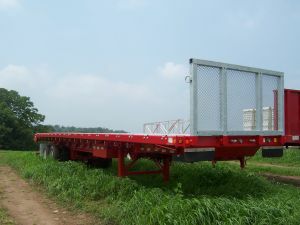 Commercial truck drivers are required by law to make sure that the goods they’re transporting are properly restrained. There are a number of federal regulations in place to monitor the cargo of these truckers, including the requirement that limits the truck’s cargo weight. This is why you’re likely to see weigh stations along interstate roads, a clear effort to help enforce these limits. These drivers are also required to ensure that their loads are secure. A truck’s contents must be restrained so that cargo does not slide around or fall off the truck. The proper restraint of these items helps to prevent rollover accidents and can prevent accidents. Neglecting to ensure that materials are secure can result in liability for damages to the trucker or trucking company. According to the most recent statistics from the National Highway Traffic Safety Administration (NHTSA), there were nearly 3,400 deaths that were the result of traffic accidents that involved a large truck in the U.S. in 2009. Nearly 75,000 people were injured in these accidents. It was estimated that there were nearly 300,000 large trucks, with the gross weight of 10,000 pounds or more, on our roadways that year. It is important to remember that if you experience an accident because of an unstable truckload, there are a number of parties that may share liability. All involved parties are responsible for following federal regulations to help reduce the risks of these types of accidents. If they fail to do so, they can be held liable for providing you with the proper compensation. If you or someone you love has been involved in a car or trucking accident in the Greater Boston area or elsewhere in Massachusetts, contact The Law Offices of Jeffrey S. Glassman for assistance. Call for a free and confidential consultation at 1-877-617-5333.